You want me to invent a better story? missing out on a life of farm work. sings so clear and bright. a blur of the hand. Your poem made me think about how some lives are violin lives and some are ukulele lives. Henry seems to have found his music in the daily pluck of the strings. I love thinking about the difference between a violin life and a ukulele life. There's beauty in both! This one isn't real either??? It feels so real. The youngest son. The violin and trumpet. The agricultural ambitions. Feel very real to me. And I love Steve's companion poem. Typing at Kinko's again. Sorry if this turns out weird. There is definitely an attempt at a sense of style in this, of someone trying to be something he's really not. But your poem captures the importance of trying on those personas when we're young and figuring our true selves out. Nope. Not true. 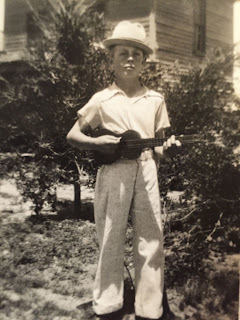 I'm pretty sure that's my dad (I think the violin player was his brother Lee), and we still have that ukulele in a drawer in the basement.